While doing research on the PogoPlug, I found there were different devices that utilised the same base technology. 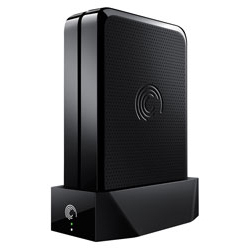 One of these, supported by the Arch Linux Arm project, is the Seagate GoFlex Home. Staples had the 1TB version on sale for $80, which is a decent price due to the floods in Thailand causing higher drive costs right now. I read the SATA interface would be faster then USB, and the integrated drive will save desk space. Also, with the OS booting from SATA, I can configure a nice swap file and have plenty of room to compile binaries. The main goal is to make this a Samba Server, hosting all my media files for XBMC endpoints. I never used Arch Linux before, so I tried a standard install in VirtualBox to see how it worked. There are a few new commands to learn, but overall it runs very well. I also tested the GoFlex with Seagate’s surprisingly fast default disk sharing solution. After a few days of use I almost wasn’t going to modify the device. That changed, however, when I needed to do some remote work, at which point you fully realise the limitations without a proper OS. Following these excellent instructions resulted in a default Arch Linux Arm install. I would point out the suggestion to make two partitions, which at first seemed unnecessary. However, if you need to start over, being able to format the OS drive without touching your data is a huge perk. The MAC address not saving and having to manually add the second partition to fstab were the only post-install issues. Next, I went through the first steps guide to do some house keeping, and then the Samba guide which took care of my immediate sharing needs. I am very happy with the results, as the low power, near silent device sits on my desk. Time will tell if the little guy can keep up, but I have high hopes of long term success.